Here’s a really in depth behind the scenes look at an aspect of photography and cinematography that we rarely get to experience. As part of their 100th anniversary, Universal Studios gave the iconic 70’s film (that’s given sharks everywhere a bad rap) a breath of fresh air. The mini documentary is pretty interesting as it walks you through the entire remastering process from start to finish. The original reel, which was shot on 35mm film, had suffered some damage throughout the years and would need to be repaired. They used a wet transfer film gate to repair the scratches, which essentially scanned the original negatives while they were wet. It’s actually a really neat process and you can see more of it in the 8:30 minute mini-doc below. You’ll also be treated to a peak at the digital editing process, along with some before and after shots which are pretty astounding. 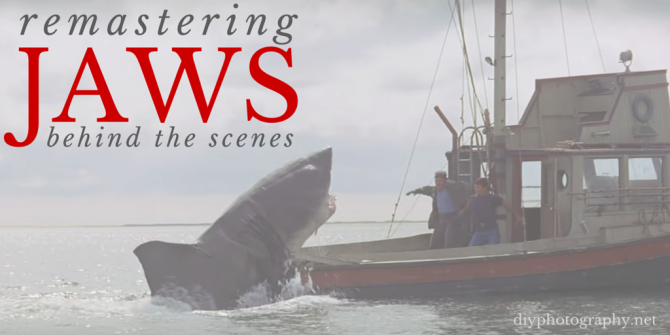 The remastered version of Jaws has been out on BluRay since 2012 and, I should warn you, after watching the clip you may have the urge to watch it! Well worth 10 bucks. I’m not sure how I feel about the restoration though. Is this really a ‘restoration’ if it excels the very first print? More of an enhancement really. As much as they kept stating that the film is unaltered, they did alter it. Case in point: the cabin scene of the boat where the external window light was made to match up. If they included the non-enhanced version, with or without the vertical line damage and scratches from the negative, I would be a lot happier. @authors and site owners: I’m a regular reader of dps. However I’m probably going to stop now. The new layout is utterly broken and horrible. In this post for example, the movie started playing but it was nowhere to be found. Also, I perfectly understand that you need ads to collect some money. However with the new layout of the site, they became annoyingly intrusive. I might have most of the problems since I generally browse the site with an iPad. But I suppose I’m not the only one. Right now it’s just no fun at all to read the site. And while I’m at it, right now I am having trouble to scroll to the send button for this comment. Whenever I try to reach it, the ads scroll in.